Federal estate and gift taxes affect only relatively large estates. That’s because individuals can exclude a very high amount of assets from federal estate and gift tax liability. The lifetime exclusion amount for individuals is $5.49 million in 2017 and indexed annually for inflation. Assets left to a surviving spouse, which aren’t subject to federal estate and gift taxes, don’t count against the exemption amount. And if certain steps are taken, the unused portion of a deceased spouse’s exemption can be used by a surviving spouse during his or her lifetime or at death. This provision is called portability. For example, if an estate transfers a $5.49 million unused applicable exclusion to a surviving spouse, who also has a $5.49 million basic exclusion amount, the surviving spouse then has a $10.98 million applicable exclusion amount to shelter property from gift and estate taxes (in 2017). One caveat is that portability is not automatic; it must be elected. An estate tax return is typically required only if the value of an individual’s gross estate exceeds the applicable exclusion amount. To make the portability election, an estate must transfer any unused exemption to the surviving spouse by filing a U.S. estate tax return (IRS Form 706), even when there is no taxable estate. 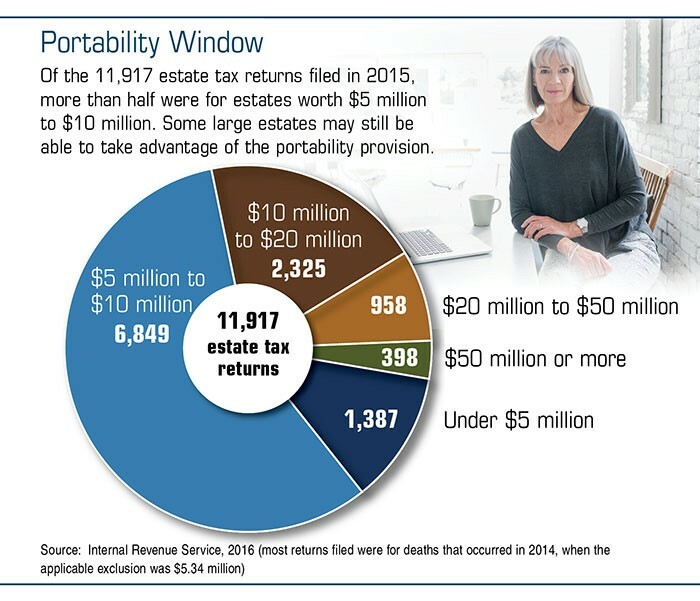 Failing to elect portability is a common mistake that could result in a larger estate tax bill after the death of the second spouse. Fortunately, a June 2017 change in IRS procedures allows more time for the estates of recently deceased taxpayers to take advantage of the tax savings offered by portability. For taxpayers who died between January 1, 2011, and January 2, 2016, estate executors now have until January 2, 2018, to elect portability by filing an estate tax return with a special notation on the top of the form that it is filed pursuant to Revenue Procedure 2017-34. The estates of taxpayers who died after January 2, 2016, will have a full two years from the date of death to elect portability by following the same procedure. In most cases, portability will be granted, unless the estate previously filed an estate tax return, or the estate was required to file a return after the death of the first spouse and failed to do so. An estate seeking portability relief after these deadlines may still request a private letter ruling from the IRS. The White House and Republican lawmakers have been discussing significant tax reforms, including the potential elimination of the federal estate tax, but it’s impossible to predict exactly what new tax legislation will look like or when it might be finalized. Still, it’s important to be aware of existing estate tax rules and deadlines that may still apply to your situation in 2017. Sooner or later, your estate documents and plans may need to be revised to reflect additional tax changes. Before you take any specific action, be sure to consult with an experienced estate planning attorney.